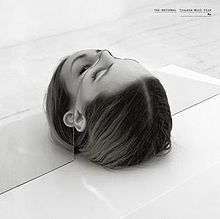 It is of The National's newest release Trouble Will Find Me. Here's the brass tacks of it: this has been the hardest review to write this year. I don't think I will personally listen to Trouble Will Find Me again, (I realized after I reviewed High Violet I didn't listen to it again) it is a gorgeous album but one I don't particularly enjoy. I can't deny the arraignments and music the band produces. If they had a different vocalist/lyricist they may be one of my favorites, but as it stands with making "pop" or "indie rock" you need an engaging front person, and Matt just doesn't do it for me on any level. All that admitted I still think it is an album that is worthy of critical praise, just not multiple spins through my personal headphones. I think it boils down that the group as a whole could use a little more heart and a little less head in their song construction if that makes any sense. The National work so hard at crafting perfect sonic indie-pop and the listener unfortunately can feel all the work as the end result too often winds up incredibly boring. It is as if playing music is really their day job and they would rather spend their nights as accountants. I have written enough now, but check out this which I wrote regarding the band's last release, I feel the same way pretty much.